It was amazing I watch My Cat From Hell hosted by Jackson Galaxy. One way to say hello to your or any cat is a sloe blink. Just slowly close your eyes and then open them. It's amazing cat's blink back and are more calmer. Hehehe!!! Have to try that! As they say, it's all in the eyes! Thanks Sandy...and for the fun Halloween card, too. Loved it! Yes, the long slow blink! The, "I am relaxed and I love you!" greeting! I call the kitty's blink back the "visual purr". Sandra happy you enjoyed the Halloween card. When after was alive I did the kitty blinked he blinked backed and smiled. 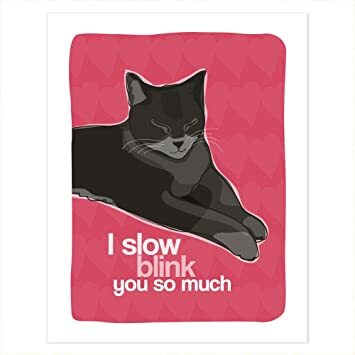 I love when a kitty slow-blinks! I do too it's awesome.